Love prosecco AND chocolate? Then this is the cake for you! Scroll down for the recipe. A couple of weeks ago a parcel landed on my doorstep. It was a large cardboard box filled with chocolate. There were bars of milk chocolate, bars of white chocolate and best of all two boxes of prosecco truffles. It’s a hard life being a food blogger! I knew that both cake club and Mother’s Day were coming up so I put one box aside to give to share with my lovely Mum (don’t worry I got her another present too) and I decided the other box would top my next cake for cake club. I’ve talked about cake club before so I’m sure you’re all familiar with the concept. Our theme for March was “Go Wild” and I knew that I was going to bake a boozy cake. The box of prosecco truffles helped me make my mind up that it was going to be a Chocolate Prosecco Cake with booze in not one, not two, but three elements of the cake! On the Friday just gone I popped open a new bottle of prosecco. I’m a big fan of the bubbles and my drinks cupboard is very well stocked. I could spare a bottle for the cake. As I creamed together the butter and the sugar I poured in 75ml of the good stuff. The chocolate cake recipe I was using was tried and tested, though usually I added milk rather than prosecco… The good news is that the bubbles make the cake lighter if anything! Once the cakes were baked and cooled I had decide how to decorate them. A chocolate cake isn’t complete with chocolate buttercream. I decided that to make it extra special I’d take my usual recipe and this time replace the milk with cream. This make a thicker, more truffle like buttercream consistency. Still pipe-able, but really luxurious! If the buttercream wasn’t going to have prosecco in then the rest of the filling definitley had to! So, I sliced a handful of strawberries in half and mascerated them in a splash or two of prosecco. I left them to soak up all that boozy prosecco flavour while I seperately piped the buttercream on the bottom and top layers of the cake. When the strawberries had had long enough in their bubbly bath I placed them on top of the bottom layer, piped a little more buttercream over the strawberries then added the top, decorated layer. The final touch had to be the dusted prosecco truffles! When you hear the pop of the cork as you open the bottle you know you’re in for a real treat. That sound means just one thing – it’s time for a celebration. This cake is perfect for birthday’s, engagement parties, house warmings and, of course, mothers day! I’ll be treating my Mum to a slice of cake later today and I hope you will too! If you start baking now you can have this cake ready for after lunch! There really is no excuse. Plus, you get to finish off the bottle of prosecco as you tuck in to a slice. It’s win-win! 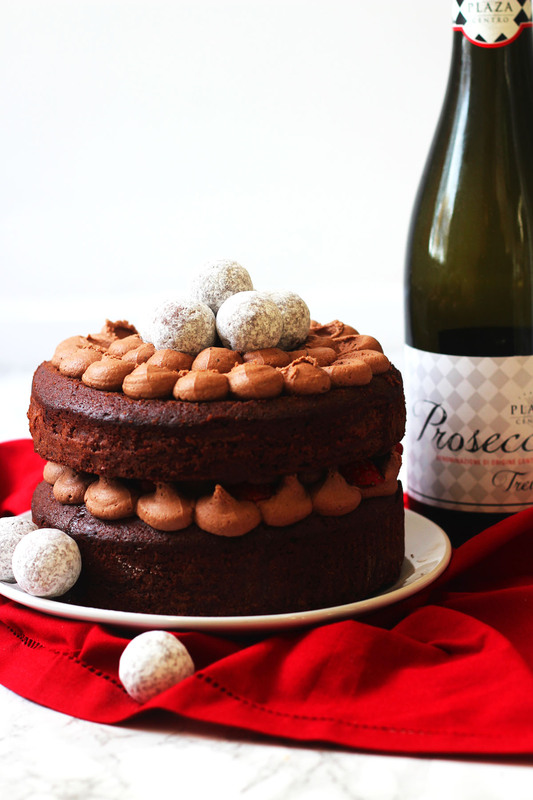 Chocolate and prosecco are two of my favourite things so I decided to combine them in this delicious celebration cake! In a large bowl, whisk together the butter, sugar and prosecco until soft. Beat in the eggs one at a time until and beat well until the mix is creamy and pale. While the cakes cool, spoon 2 tbsp of prosecco over the halved strawberries and let them sit. Once the cakes have cooled completely, melt the chocolate either slowly in the microwave or a bain marie. Place the chocolate to one side and allow to cool slightly but make sure it stays pourable. In the meantime, beat the butter, cocoa powder and icing sugar together. Pour in the melted chocolate and continue to beat. Finally pour in the cream and whisk until the buttercream is soft and spreadable. Pipe circles of buttercream over the bottom layer of the cake. Drain the strawberries and layer over the buttercream. Pipe more buttercream over the strabwerries and place the second layer of the cake on top. Finally, pip circles around the outside of the top layer. Using a small spatula drag the centre of the piped circle towards the centre of the cake. Pipe another ring of buttercream slightly inside the first, again use a spatula to drag the buttercream towards the centre. Repeat until the whole cake is covered. Pipe a small mound of buttercream in the centre then top with the prosecco truffles. If you know someone who might like this recipe make sure you share it on Facebook and Twitter. Or, why not pin it for later! Enjoy! Port goes well with dark chocolate too. This is a really beautiful presentation and cake! Looking forward to making this lovely recipe. Yumm..What a beautiful cake and sounds great too. I love baking with prosecco, it really does give a lighter texture to most cakes. Bubbles go with everything, chocolate included! I couldn’t agree more Rae! I love the texture it gives! This is just so gorgeous! I am intrigued at the prosecco…I think its a marvelous idea. I must give this a try sometime. Ok prosecco is like my favorite thing ever so I HAVE to try this cake! YUM! What a prefect spring dessert! Now that is a celebration cake! 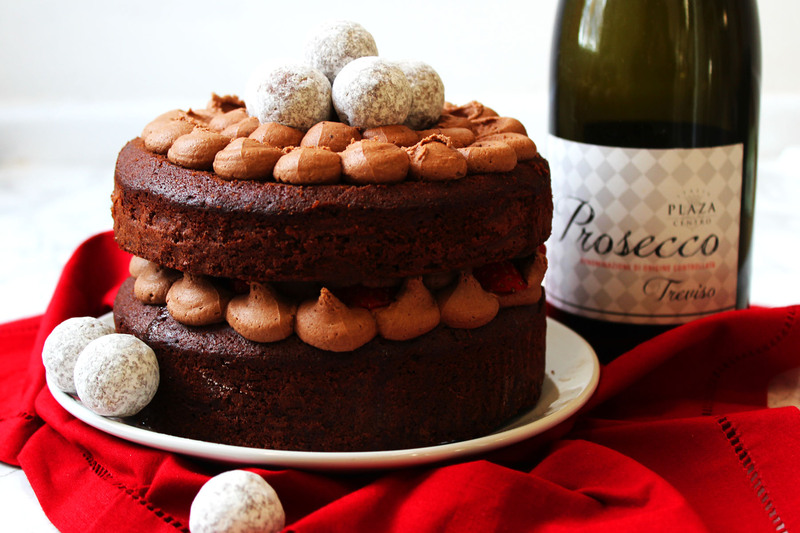 I love adding sparkling wines to desserts and the amount of prosecco you’ve managed to get in this cake is EXCELLENT! Haha the more booze the better in my opinion Amanda 😉 glad you like it! I’m completely in awe of this cake – it looks amazing and it sounds like it tastes amazing too. What a brilliant combination of flavours. YUM! Thank you so much Helen, you make me blush! I was very pleased with how it turned out. Especially as I decorated it so late on Friday night! It could have been a disaster! OMG what have you started?! I’m going to be subbing milk for Prosecco in all my bakes from now on. Now that is what I call a cake! 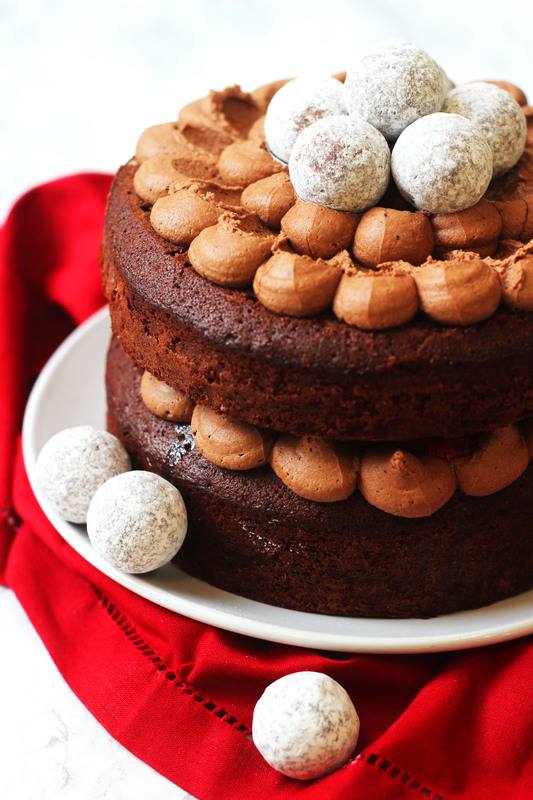 I’ve made a chocolate wine cake before, but I reckon this one tops that easily. You’ve decorated it beautifully and I love the truffles sitting on top. I also heartily approve of big boxes of chocolate turning up unexpectedly. Will this cake stay ok for a few days although it has fresh strawberries in? Hi Natalie. After a day they will probably start to break down. Id avoid assembling it until the day but bake the cake in advance? This looks and sounds brilliant. Is it a specific kind of Prosecco you go for? I tried a Prosecco buttercream the other day and after mixing the prosecco, I could hardly taste it was there. Has it got more of a presence in a cake? Hi Rhys, thanks for stopping by! It is a subtled flavour but it’s definitely there. I can’t say I’ve ever tried making prosecco buttercream but I imagine its so sweet it completely drowns out the prosecco flavour. Give it a go and let me know what you think!